PHOENIX (April 12, 2018) – GlobalTranz Enterprises, Inc., a leading technology-driven freight management solution provider, has been named No. 10 on the Transport Topics Top 50 Freight Brokerage List for the third year in a row, moving up in ranking from No. 13 last year. 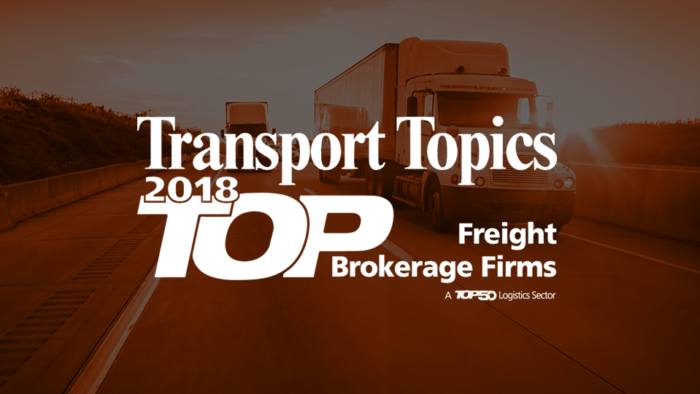 One of the most respected publications in the trucking and freight transportation space, Transport Topics annually names the biggest players in the industry to its Top 50 Freight Brokerage List. This distinction speaks to GlobalTranz’s record year-over-year growth and continued leadership in third-party logistics and transportation management systems. GlobalTranz announced its 2017 financial results, posting total revenue gains of 55 percent and earnings growth of 42 percent year-over-year, outpacing many competitors in the industry. With the successful completion of five acquisitions in the last fourteen months, including Global Freight Source, Logistics Planning Services, Worthington Logistics Solutions, Apex Logistics and AJR Transportation, GlobalTranz continues to identify targets for strategic mergers and acquisitions. Named Top 10 3PL to Watch and listed as a Top 100 3PL by Inbound Logistics.